Gearbox today announced that the mysterious highest bidder on Homeworld was actually them. Luke gave us a rundown on the runners up last night, but the winners of the RTS series once owned by THQ wouldn't reveal themselves at the time. Someone Now Owns Homeworld. But Who? The only other details Gearbox mentioned in today's announcement included their dedication to preserving Relic's franchise, and making those experiences available on "today's leading digital platforms." 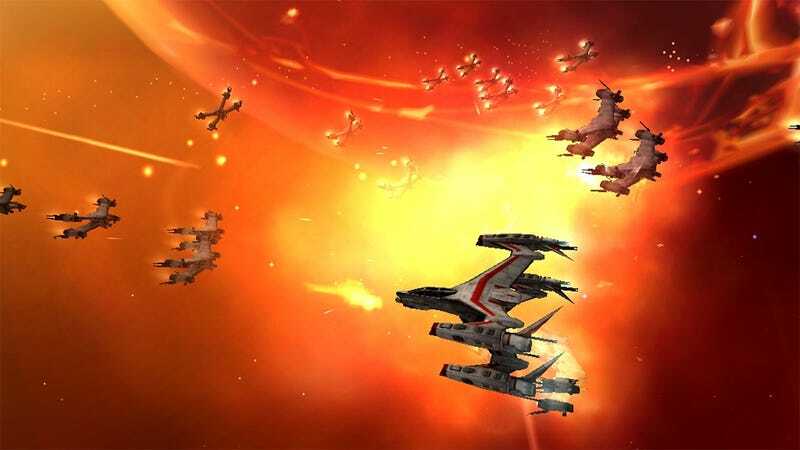 So it sounds like they want to bring Homeworld and Homeworld 2 to modern platforms. Gearbox is perhaps most favorably known for their action/RPG Borderlands franchise and the Brothers in Arms series. CEO Randy Pitchford promises Brothers in Arms is still getting new titles, and we're sure to see more Borderlands 2 content, as well. The team of developers has also dabbled in bringing franchises—Duke Nukem if you're keeping track—back to life before. It wasn't the successful resurrection people had hoped for, though. They also recently released Aliens: Colonial Marines, which was a shocking mess. Homeworld feels like it could be unfamiliar territory for Gearbox, considering it will be their first strategy title, but we can leave Luke to the speculation on how that might actually fare.